Touching down in the mecca of motorsport in Great Britain, Formula One reaches the final destination of its first ever triple-header. The British Grand Prix will be the tenth round of this year’s championship. Following hard on the heels of the stirring French and Austrian GPs, the thrilling fight between Ferrari, Red Bull and Mercedes is set to write another thrilling chapter. After Mercedes held the reign in the qualifying session and in the opening phase of the race at Spielberg, both cars of the Brackley-Brixworth-based team were forced to retire from the race, allowing Sebastian Vettel and the Ferrari team to take the championship lead back. The 2018 British Grand Prix will be the sixty-ninth time that the race will be run as a World Championship event since the inaugural season in 1950. The British race is the oldest in the Formula One calendar as the 1950 race at Silverstone was round one of the first championship season in 1950. It and the Italian Grands Prix are the only two Formula One World Championship Grands Prix that have been staged during every season that the championship has been held. The first ever Grand Prix was held in France back in 1906, but Great Britain is deemed to be the mecca of motorsport. The first purpose-built motor racing track was built in Brooklands in 1907, located just outside the British capital of London. The first British GP was established by Henry Segrave in 1926 which was won by the French Louis Wagner. 1927 saw Brooklands hosting the second British Grand Prix which was won again by a French driver named Robert Benoist. When the Second World War ended in 1945, the legendary Brooklands had fallen into disrepair and so Silverstone was adopted by the Royal Automobile Club as the home for the British Grand Prix in 1948. Silverstone started life as an aerodrome. The 1948 and 1949 races were won by Maserati. 1950 saw the birth of the Formula One Championship and the Silverstone track gave place to that. Alfa Romeo’s Giuseppe Farina was victorious in the first ever F1 Grand Prix. The next four years saw Ferrari dominating the venue with José Froilan Gonzales and Alberto Ascari. The Argentinian’s win in 1951 was the first ever victory for the fabled Ferrari stable. In 1955, the British GP moved to Aintree which began to alternate the race with Silverstone for the next years. Aintree played host to the GP in 1962 for the last time. Out came Aintree, in came a new venue. 1964 saw the first Formula One race at the southern English circuit known as Brands Hatch, located in Kent, just outside London. The track was built in the early 1950s and had been extended in 1960. Silverstone hosted the British Grand Prix in odd-numbered years and Brands Hatch in even-numbered years. Since 1987, Silverstone has been a fixture on the F1 calendar, hosting the British Grand Prix in every single year. Silverstone's layout, like Brands Hatch, had changed little since 1949. 1987 saw Silverstone modified; the Woodcote chicane was no longer used and a new left-right chicane was built on the Farm Straight just before Woodcote. After the tragedies of Imola in 1994, a chicane was installed at the flat-out Abbey corner 6 weeks before the event was due to take place and Stowe corner was slowed considerably. The 2010 race saw a new circuit configuration being used, using the brand new "Arena" layout. For 2011 a new pit complex was built between Club and Abbey Corners, to where the start/finish line was moved. 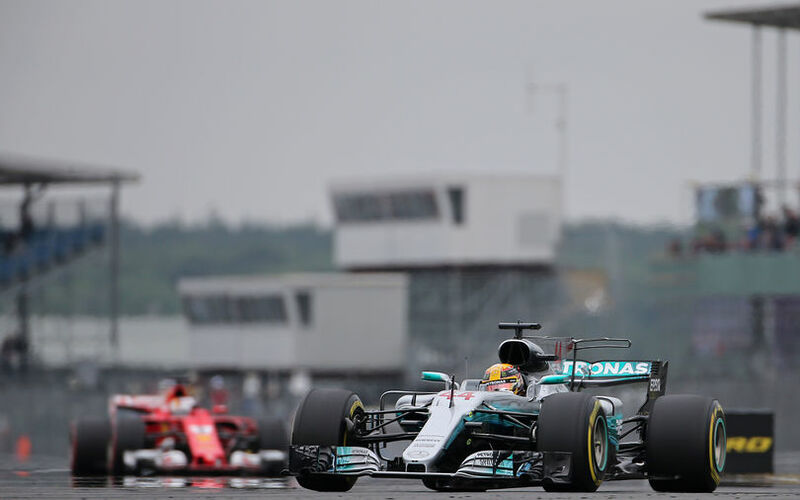 Silverstone is still a very fast circuit- with average speeds up in the 145 mph range for Formula 1 cars; one of the highest average speeds on the F1 calendar. Ferrari is the most successful team in the history of the British Grand Prix. The Italian team claimed victory 15 times while local hero team McLaren was victorious 14 times. Williams won the British GP on 10 occasions. Lotus has eight, Mercedes six, Red Bull three victories on their tally while Cooper, Tyrell and Reanult are two-time British GP winner squads. Among the drivers, it is Alain Prost, Jim Clark and Lewis Hamilton who have the highest number of triumphs, all three drivers have five wins to their names. Nigel Mansell won four wins. Jack Brabham, Niki Lauda and Michael Schumacher all won on British soil three times. Among the two-time British GP winners are Alberto Ascari, Stirling Moss, Jaques Villeneuve, Fernando Alonso, David Coulthard, Mark Webber, Emerson Fittipaldi, José Florian Gonzales and Jackie Stewart. The track of Silverstone has a length of 5.891km which puts it to the group of the longest tracks on the current calendar. Drivers have to drive 52 laps in the race, covering a race distance of 306.198km. The lap record was set by Lewis Hamilton in 2017. The Briton clocked a 1:30.621 in last year’s race. The pit lane where the speed limit of 80kph is in force is 376.4m long. Driving through the pit lane, drivers only lose around 16.9s because, doing so, they can skip the last complex of slow corners. The Silverstone track has always had the reputation of a high-speed circuit due to its blindingly fast corners. After the 2010 reconstruction work, the track maintained its status as one of the fastest tracks on the calendar. It has 18 corners of which 10 are right-handed ones. Drivers are put under enormous G-forces in turn one, nine and eleven. Almost 70 per cent of the lap is taken at full throttle which means not only the aerodynamics in the high-speed turn, but also the pure engine power play a big role in achieving a competitive lap time. The track is often used, meaning that its evolution is not that significant as seen on other venues. Because of the series of high-speed corners, drivers only brake four times, putting relatively little pressure on the brakes. Silverstone has three DRS zones this year. The detection point of the first zone is 25m before Turn 3, with the activation point 30m after Turn 5. The second detection point is at Turn 11 with the activation point at the exit of Turn 14. The final zone has a detection point 83m before Turn 16 and activation 62m after Turn 18.